The features of ALBERTO bike trousers are no gimmick; they make it easy for every cyclist to travel the city. Due to the 3XDRY material, the trousers are particularly water and dirt repellent, while remaining breathable. The 3XDRY technology, developed and patented by Schoeller, ensures optimum moisture transport whilst whitstanding any rainfall — water simply dries off. At the same time, any moisture forming during exercise is quickly absorbed by the inside of the fabric and transported away from the body, meaning the textile dries much faster due to 3XDRY technology. In addition, the material provides a pleasantly cool feeling on the skin. A special detail in the 3XDRY men's trousers: reaching into the terry-lined front pockets dries your wet hands after a ride in the rain, or after mounting a wet bike. 7% spandex content ensure the trousers stay flexible whilst retaining their shape. The waistband is cut higher at the back and is also elasticated, ensuring a comfortable ride in any position. A stopper ribbon inside the waistline prevents the shirt slipping out when tucked in. The wide back pockets are slightly offset, so that the seams do not interfere with the position of the saddle area when riding. Reflective stripes on the rear belt loops as well as on the inner hem — visible when the trousers are turned over — ensure good visibility. 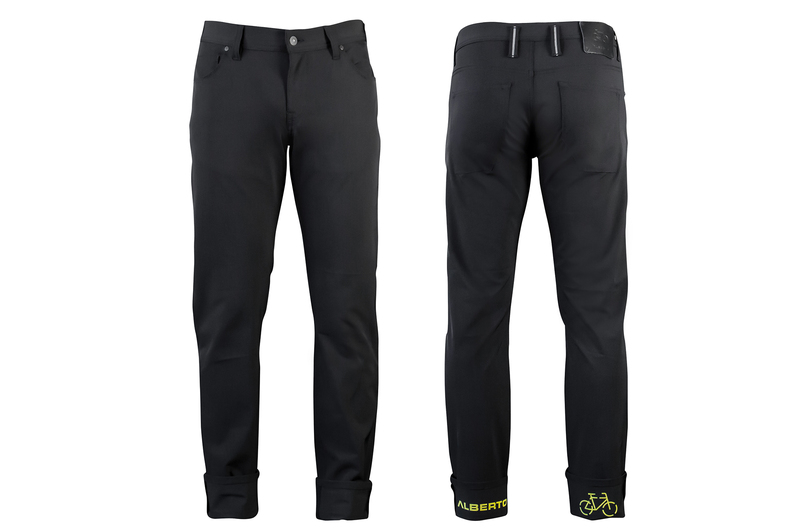 These trousers are the perfect companion for frequent riders who still want to look well-dressed — with extremely robust materials and protection against rain and dirt, and the added advantage of being quick-drying. Regular ironing at a low temperature is recommended to maintain good water repellency. Our model is 1,80 m tall and is wearing size 30/32. Five pocket jeans, zip-fly closure with straight leg and slightly higher waistband. Material: 7% spandex. 93% polyamide.